#OWS: We are ALL leaders! What is the difference between saying none of us is a leader and saying all of us are leaders? At first glance these two phrases may seem like two ways of saying essentially the same thing. We believe in organizing in a way that is more horizontal than vertical. We believe in equalizing participation and resisting social hierarchies. But the word leadership can mean a lot of things. There are things we associate with leadership that have nothing to do with hierarchy. Taking leadership can mean taking initiative on moving a project or task forward. It can mean looking for what is needed in a group, and stepping up to do that thing. These positive group-serving associations with leadership are the reason why there’s an important difference between the idea of “no leaders” and the idea of “all leaders”. If we are part of a group that talks about having no leaders, this phrase can inadvertently make us overly hesitant about stepping up to take initiative. It can create a group culture where as individuals we become reluctant to be seen as moving something forward &#151 because our peers might see us as a “leader”, which would be a bad thing. Strong group identity is essential for social movements. There can be no serious social movement&#151the kind that challenges the powerful and privileged&#151without a correspondingly serious group identity that encourages a core of members to contribute an exceptional level of commitment, sacrifice and heroics over the course of prolonged struggle. This kind of group identity is clearly emerging right now among core participants in occupations across the country and around the world, and that’s a good thing. However, strong group identity is also something of a double-edged sword. The stronger the identity and cohesion of the group, the more likely people are to become alienated from other groups, and from the broader society. The Political Identity Paradox states that while social change groups require a strong internal identity in order to foster the level of commitment needed for protracted struggle, this same cohesion tends over time to isolate the group; and isolated groups are hard-pressed to build the kind of broad-based power needed to achieve the big changes they imagine. The past ten days have been amazing. I took the train down to NYC last Wednesday, to see if I might lend a hand to the Wall Street occupation for a few days. There is so much going on. I don’t even know how many working groups there are, but today I heard that there are at least a few dozen. There are so many moving parts. I feel like a pebble in a volcanic eruption, and it’s a wonderful feeling. A longer print version of the interview can be read here. I’ve decided to stay a while longer &#151 probably at least a few more weeks. I’m hoping to stay involved in the press working group, but to concentrate more of my time on training and leadership development. It’s amazing how many new folks are pouring into this social change effort right now. It’s hard on the ground to not to get caught up in almost continuous crisis/triage mode, but it’s so important that we seize this moment to help some of these great young folks become long-term leaders. I’m trying to carve out a little time each day to write up or adapt a new one-pager covering a particular #occupy-related skill or strategy concept. Two days ago I set up a basic Wordpress site called #occupyWINNING (@occupyWINNING on Twitter), which will house this project. I plan to format most of the materials into PDFs too, so that people can easily print and distribute at occupations if they find any of the tools useful. I’ll be cross-posting everything here too. In addition to what I post at #occupyWINNING, I’m hoping to soon start collaborating with other trainers. I’m excited and grateful to be here. Bringing in new participants and volunteers is essential to an occupation-or any group or organization-that wants to grow in size and capacity. The momentum of the Occupy Wall Street movement has quickly attracted a lot of people to occupations across the United States and around the world. But attracting or recruiting new people to your occupation or group is only the first step. Getting them to stick around is a much bigger challenge. The good news is that there are tried-and-true methods you can use to plug new participants and volunteers into tasks and roles that will build their investment and leadership in the collective effort, and will increase what you all are capable of achieving together. 1. Greet and get to know newcomers. When someone shows up at your occupation, march, rally, or action, they are indicating an interest. Greet them! Find out about them! And don’t just invite them to come to your next meeting. Even the most welcoming and inclusive groups tend to develop their own meeting culture that can unintentionally make new folks feel like outsiders. To increase your new participant retention rates, take a few minutes to stop and talk with new folks. Get to know the person. Find out about what attracted them to your effort. You might ask about what kinds of tasks they enjoy doing, what they are good at, etc. If that goes well, you might ask them how much time they have. You can tell them more about what’s going on with the effort – and discuss with them what their involvement could look like. While this level of orientation requires some time in the short-term, it saves you time in the long-term – because more people will plug into the work faster, and stick around longer. It may make sense a working group to take on the ongoing task of greeting, welcoming, and orienting new folks. 2. Accommodate multiple levels of participation. In short, some people can give a lot of time, and some can give a little. Organizers with more time on their hands should avoid projecting their own availability as an expectation onto others. A foolproof way to drive new folks away from your occupation or group is to consistently ask them to give more time than they are able to give. Instead learn what kind of time commitment is realistic and sustainable for them. Help them plug into tasks and roles that suit their availability. Check in with them about how it’s going. Are they feeling overextended, or would they like to take on more? Take responsibility for helping new folks avoid over-commitment and burnout. 3. Make people feel valued and appreciated. If you want to inspire people to stick with this burgeoning movement for the long haul, make them feel valued and appreciated. It’s basic. People like to be around people who respect them, and who are nice! If we want to compete with the myriad of often more appealing options for people’s free time, then we have to treat each other well and take care of each other. Notice and acknowledge new folks’ contributions, however small. Make time to check in with them outside of meetings. Ask their opinions often: What did they think about the meeting? the event? the action? Bounce your ideas off of them and ask for their feedback. Much has been made by some news outlets and pundits about the supposed “incoherence” of the Occupy Wall Street protests. “The protesters” don’t have a coherent message, we are told. They can’t even agree on any solutions. What the heck are they proposing? This angle is wrong-headed. The strongest and most successful social movements in history have always tapped into multiple concerns that are important to different swaths of society, and often articulated in different ways. It’s not typically the responsibility of a broad movement to propose specific policy solutions &#151 at least not at this stage in the process. It’s on us to create pressure to move society in a direction. When we do that successfully, windows will open to fight for this or that specific change. The bigger a movement we grow, the more pressure we create, the more substantial and meaningful those windows for measurable gains become. And historical perspective is not all that’s wrong with the “incoherence” frame. There’s a pretty damn clear coherence to Americans’ anger at Wall Street right now. If it doesn’t upset you that the top 1% is still making record-high profits and paying record-low taxes while the rest of us struggle just to survive, then I don’t know that I’ll be able to explain it to you. But I think most people feel it in their gut. That’s why us being here is resonating with so many people. That’s why this movement is drawing so much attention, and why I think it’s going to continue to gain momentum over time. The momentum is really starting to spread beyond the “usual suspects”. It’s important to emphasize and encourage this. For example, while coastal occupation actions have drawn the most media attention so far, actions are also happening all across “Middle America”, from Ashland, Kentucky to Dallas, Texas to Ketchum, Idaho. People are suffering here in Iowa. Family farmers are struggling, students face mounting debt and fewer good jobs, and household incomes are plummeting. We’re not willing to keep suffering for Wall Street’s sins. People here are waking up and realizing that we can’t just go to the ballot box. We’re building a movement to make our leaders listen. What a day at #OccupyWallStreet! What a morning! Mayor Bloomberg’s attempt to frame Occupy Wall Street participants as dirty and unsanitary and to use the slander as a ruse to evict us from Liberty Plaza failed miserably. 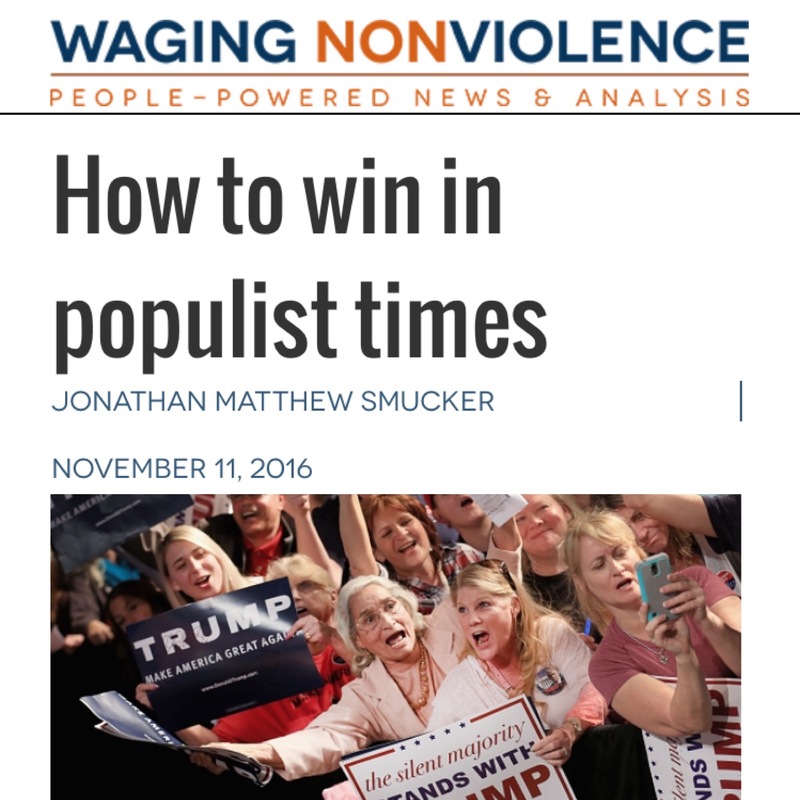 Not only that, in classic political jujitsu, organizers used the ploy to catalyze even broader popular and political support. With the threat of eviction, yesterday local and national organizations put out the call to come to Liberty Plaza this morning and to call the Mayor. By 6am this morning the crowd had swelled into the thousands. By 6:30am the Deputy Mayor had announced that the “cleanup” was off &#151 at least for today. And the prospect of trying something similar anytime soon probably doesn’t look very appealing either to Bloomberg or to Brookfield Office Properties, the owner of the park (the park’s usage is public). Brookfield’s involvement in the subprime market is starting to generate some attention since their decision to mess with the anti-Wall Street occupation. That’s certainly better than the Tea Party has ever performed. I keep having these “wow this is really happening” moments. I took the train down to NYC on Wednesday morning and plugged into the press team here. I’ve been swamped with that and too busy to write much here, but I’ll be tweeting (follow me here) when I can, and I hope to write more soon. I’ll be here for at least the next week or so. Glenn Greenwald asked yesterday whether Occupy Wall Street “can be turned into a Democratic Party movement?”. He discusses how the tone of establishment Democrats has quickly shifted and how many in the Party&#151including the White House&#151are now clamoring to figure out how to ride the anti-Wall Street populist wave. Greenwald is right, I think. Very few of the committed folks who are sacrificing time, safety and comfort to make these occupations happen are going to switch uncritically into re-elect Obama mode. However, the fact that establishment Dems are clamoring to figure out how to co-opt this energy is a serious victory for genuine progressives and Left radicals. This is what political leverage looks like. Radicals haven’t had it in this country for a very long time, and now we’re getting a taste of it. Occupy Wall Street Is You. A week into the Occupy Wall Street actions in New York, I wrote a short article with perhaps an overly harsh title, Occupy Wall Street: Convergence of a Radical Fringe. I have to admit that I was not very hopeful about the prospects of this mobilization. The rhetoric of the initial call to action seemed out of touch (except for reaching radicals). As inspired by the Arab Spring as I have been this year, I didn’t think&#151and still don’t think&#151you can neatly transplant a tactic from one context to a radically different context. Indeed, history is littered with tragically failed attempts to do so. More to the point though, it looked to me like the brave radicals who kicked this thing off were doing the usual thing of putting their counter-cultural foot forward first, and dooming the action to be locked onto that lonely path, where so many Americans who agree with our populist sentiments are inoculated against us as the messengers. But grassroots movements for change are more often than not rife with all kinds of clumsy missteps. And thankfully the factors that I pointed to have not been enough to stop the growth of this audacious and persistent movement. This weekend House Majority Leader Eric Cantor decried the “growing mob” of Wall Street protesters, while House Minority Leader Nancy Pelosi expressed her support, and the New York Times also endorsed the protest. Overnight, a political force is being born; one that has the potential to frame the national debate and finally create real populist pressure, a counter force to the formidable power of conservatives and big money. This thing has, no doubt, gone big. It needs to go bigger. And it needs all of us who are sympathetic to help it to go bigger. If you’re waiting to join the perfect action, where you have no critique of any of the visible actors, you will wait forever. History will pass you by. Social change is a messy enterprise. Now is the time to dive into the wonderful mess. Bring your skills, your time, your money &#151 even your critiques. Most importantly, bring the people you know &#151 not just the “activists” you know. These issues resonate with most Americans. So let’s challenge ourselves to have uncomfortable, unpredictable conversations with the people we know, from our workplaces, our families, our places of worship, our neighborhoods &#151 not just the self-selectors who we meet in explicitly “activist” spaces. It’s up to us to make sure Occupy Wall Street’s growth trajectory continues. See you in the streets.